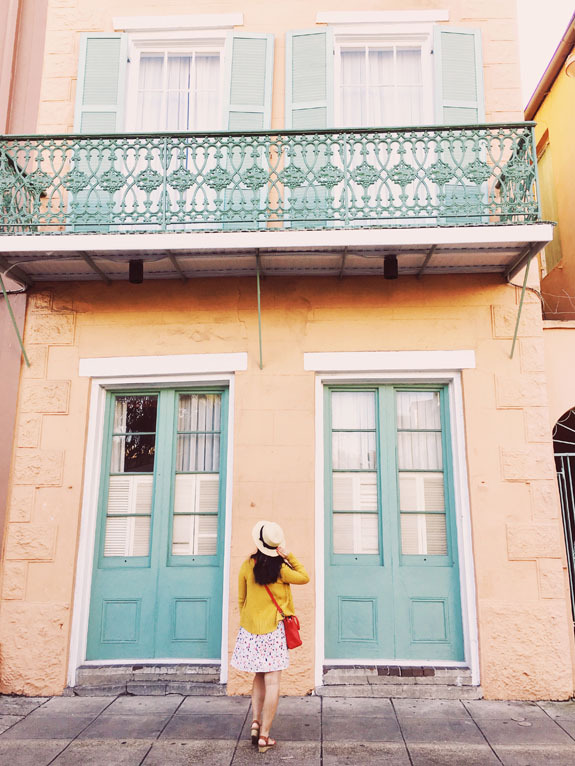 How does one spend a perfect 3 days in New Orleans? Here is the ultimate guide to what to do, see, and eat! Is there any city that's quite like New Orleans? From the historical charm of the French Quarter, to the debauchery of Bourbon Street, the live music on every street corner, and the fusion of French, Spanish, and Afro-Carribbean cultures, there's nothing quite like the Big Bayou. 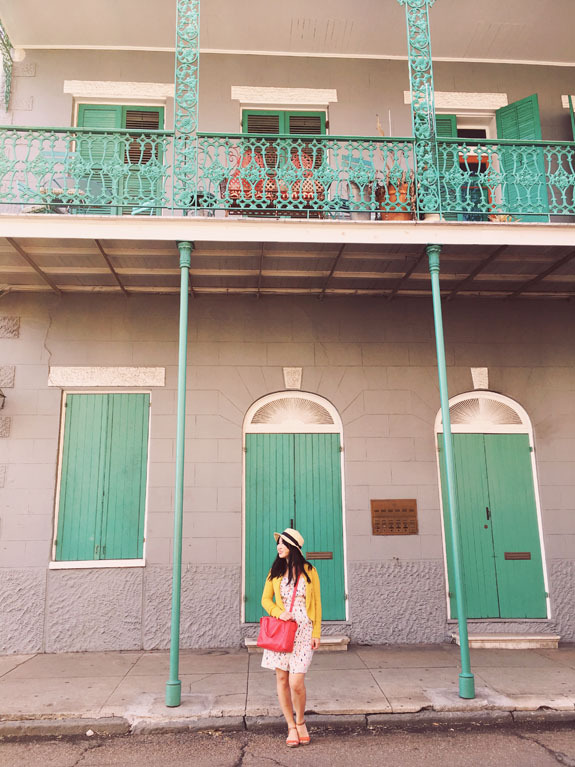 This has been a city that has been on my bucket list forever, and when I finally spotted a cheap flight there, I booked it immediately and finally got to spend 3 days in New Orleans. New Orleans may have been devastated when Hurricane Katrina hit, but it has come back stronger than ever before. There is an unwavering spirit about this city and its residents that can't be found anywhere else. In the years that have followed, New Orleans has also reinvented itself into a hip city known for its vibrant culture, and an up-and-coming culinary scene. The people here are also some of the friendliest you will ever meet, and you will experience Southern hospitality wherever you go. The city takes the official Mardi Gras slogan, laissez les bon temps rouler, or "let the good times roll" seriously - this is a city all about having a good time, whether its breaking into spontaneous dance party as a brass band parades down the street, walking down the street with a daquiri in hand (yes, open cups of alcohol are allowed at all hours), or indulging in those famous beignets from Cafe du Monde (oh my god, those beignets are something dreams are made of). Ready to have a good time? 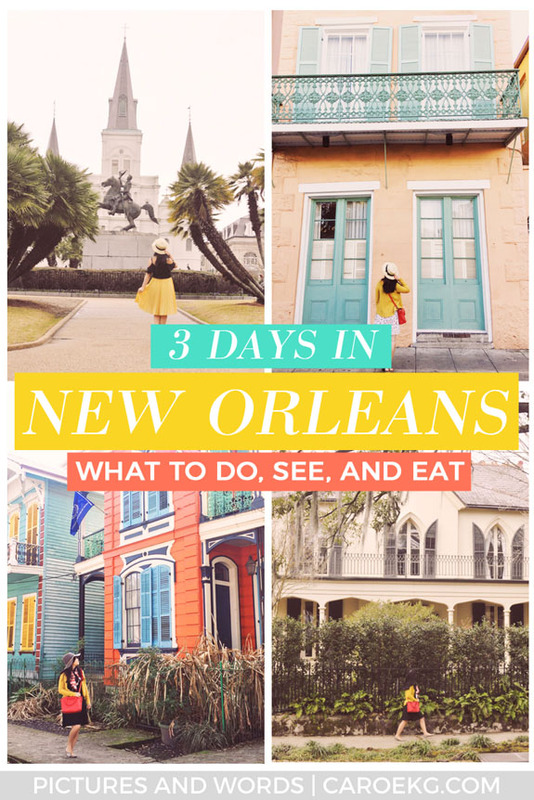 Keep on reading for all the things you must do, see, eat and drink in 3 days in New Orleans. May through September are known as being hot, humid, and miserable in New Orleans - they call it "double 100" for 100 degree temps and almost 100% humidity - and you may also encounter a hurricane sometime from August through November. However, the city is generally less expensive and less crowded during those months. Winters are relatively mild, with highs in the 60s, and can be a good time to go. 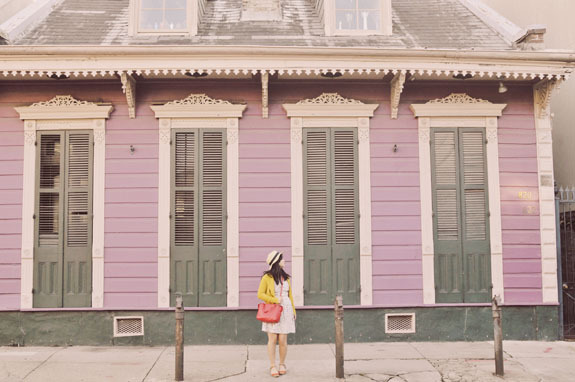 The most popular time to go to New Orleans is in the spring, when the weather is the most pleasant. The city also comes alive during its Mardi Gras (February) and Jazz Fest (April) celebrations during these months, which makes it an exciting time to visit. However, keep in mind that it can be a crowded and expensive time to be in town. We visited in early February, about a week before the main Mardi Gras festivities. While the main festivities fall on the weekend before and on Fat Tuesday (which before Ash Wednesday), there are celebrations that go on for a month before the main events. I found that being there a week before the madness was great because I got to see the city come alive, see it decked out in all the Mardi Gras decor, and partake in all the excitement, but it wasn't too crazy (let's be real guys - I would love to experience Mardi Gras in all its glory, but also I'm old and can't hang anymore). I got to see some of the parades (Barkus, or the dog parade, was so cute! ), and saw people celebrating and throwing confetti and beads from their balconies, and it was just a super fun vibe! 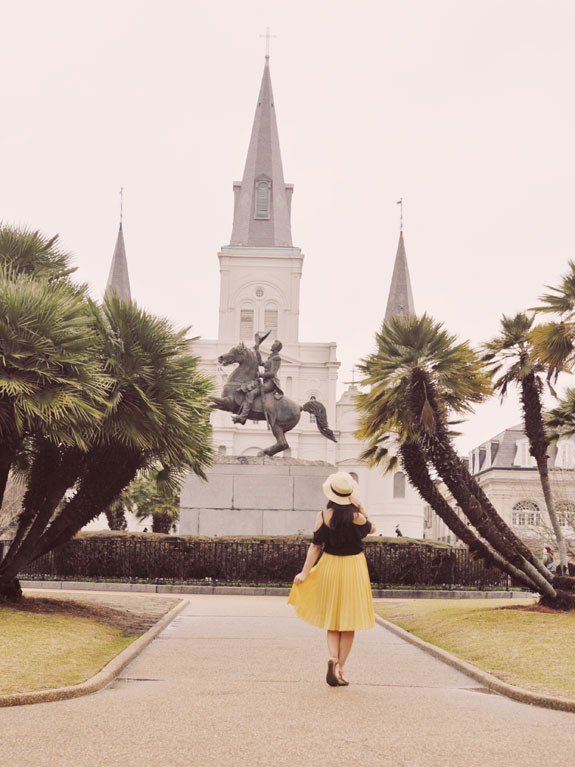 The easiest way to get to New Orleans is to fly into Louis Armstrong International Airport, which is a relatively small airport but offers connections to many domestic and international destinations. It is located about a 30 minute drive out of city center. From there, you have a few options for getting into town. The official taxi fare from the airport to the French Quarter is $33 for 2 people (or $14 per person for more than 2 people). An Uber or Lyft ride will cost you ~$25, but this depends on traffic and surge conditions. There are also many shared-ride shuttles services to many downtown hotels for around $20 per person. You can also take a city bus into town, which is super cheap ($2), but it is not the most efficient way to get into town. Many of the main attractions in the downtown and French Quarter are easily walkable to each other. From downtown to points of interest in the Garden District and Uptown (like the Lafayette Cemetery, Magazine Street, and Audubon Park/Zoo), you can take the historic streetcars, which are an attraction worth checking out themselves. A one-way fare is $1.25, but you can get a 1 or 3 day "Jazzy Pass" ($3 and $9, respectively) for unlimited rides, which is what we did. You can purchase these at any one of the Walgreens around town. The pass also works on the city buses. Otherwise, we found Uber and Lyft an easy and convenient way to get around. Not "New Or-LEENZ," or dear god, "N'awlins," Just don't. Well, unless you want to look like an idiot, then be my guest. There are numerous accommodation options in New Orleans, including many chain and boutique hotels, Airbnbs, and hostels. 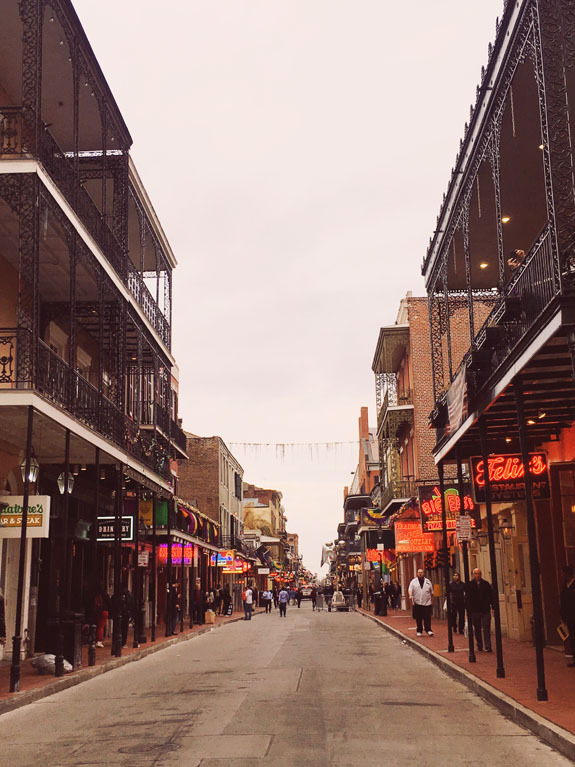 Most of the hotels are centered in the downtown and French Quarter areas, which is puts you in the middle of the action and is a convenient starting point for getting around to all the main tourist attractions. The Arts/Warehouse District is also a good option, and it is known as an upcoming, trendy neighborhood. 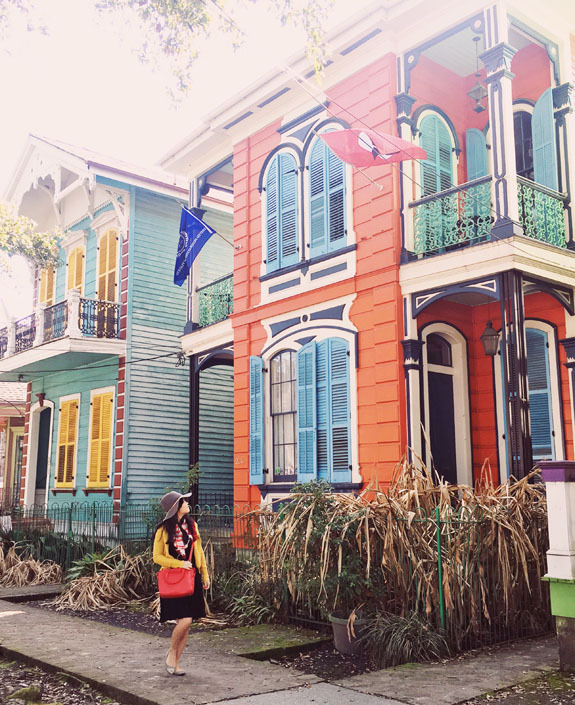 If you want to stay in a quieter area, but still relatively close to the main tourist drag, there are also a few hotels in the Garden District, from which you can easily get around via streetcar. 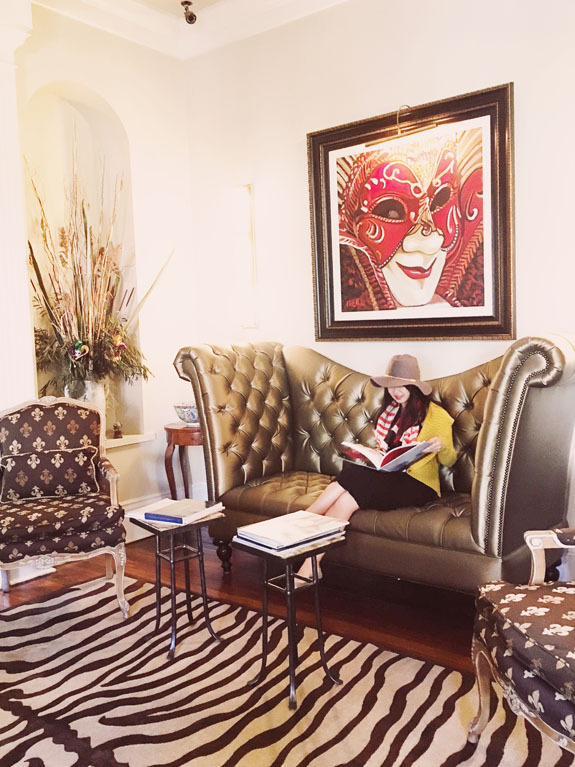 We stayed at the Hotel Maison de Ville, which is located in the heart of the French Quarter. 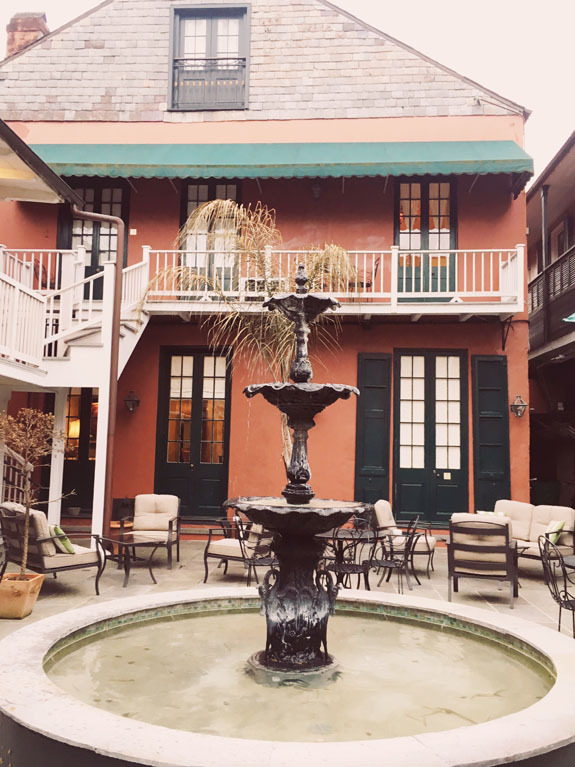 This historic boutique hotel, which has a history dating back to the 1700s and is the second oldest free-standing building in the neighborhood, is within walking distance to many attractions and popular restaurants and bars. It is also a block away from the famed Bourbon Street, which has its pros and cons. However, you definitely cannot beat the location and it was a convenient starting point for all our New Orleans adventures. 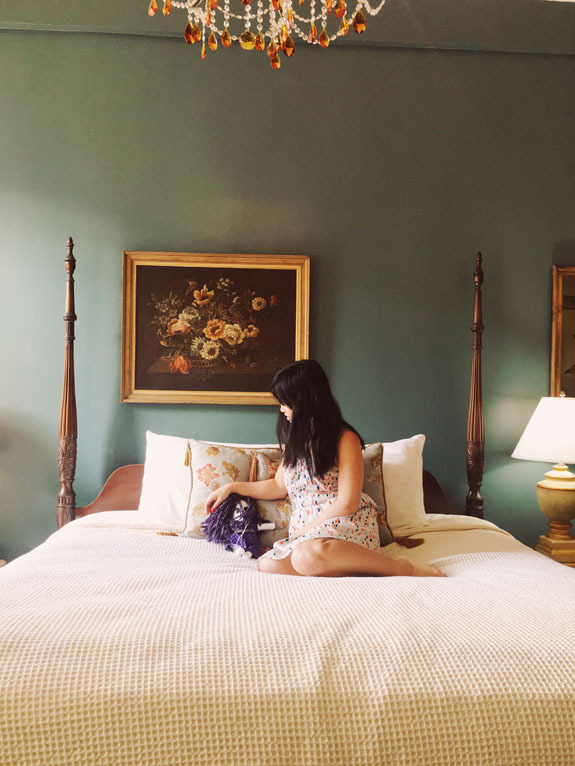 The gorgeous hotel has a home-y bed and breakfast feel, and is furnished with an eclectic mix of period furnishings and antiques that transport back you in time. Each of the rooms have a unique theme and decor, and feature a balcony overlooking either Toulouse Street or the beautiful private courtyard, which is also a great spot to relax, unwind, and enjoy some breakfast or a beverage. The hotel also has a 24-hour snack bar that also serves pastries and coffee in the morning, as well as a parlor room. You can read more about Hotel Maison de Ville in my review here. 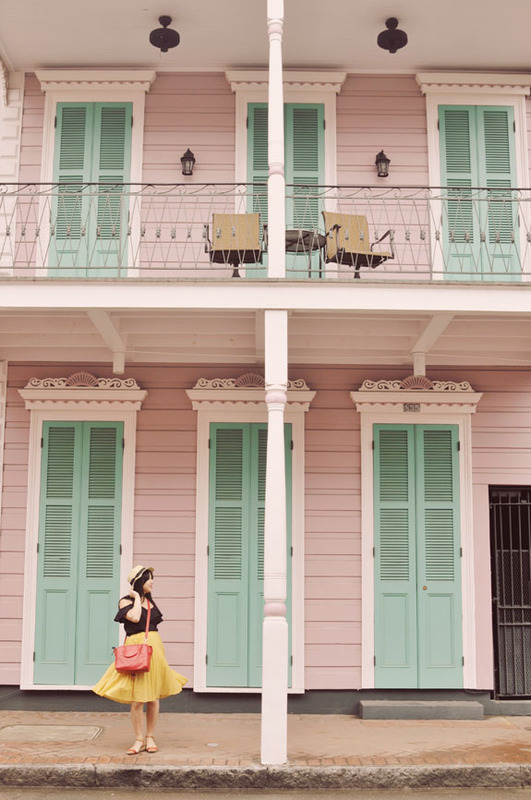 Check out more New Orleans hotels here. 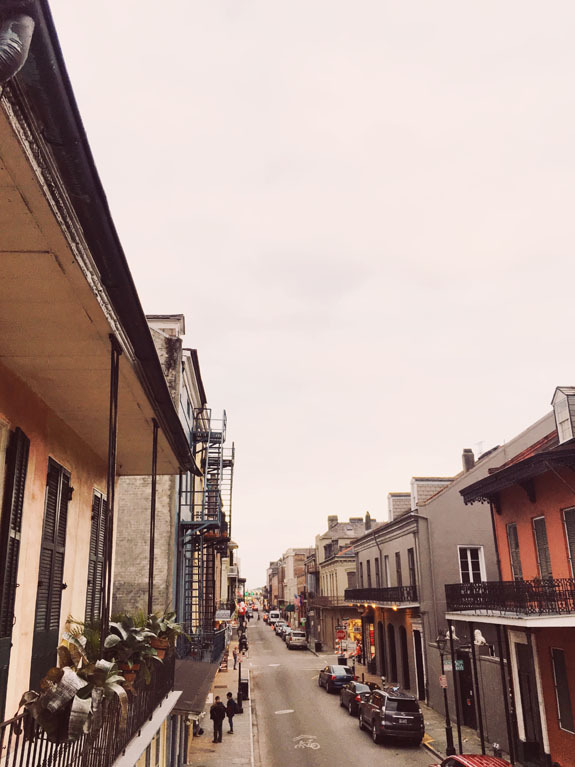 The French Quarter is the oldest neighborhood in the city, and dates back to the 1700s when New Orleans was a French colony. Quick history crash course in case you aren't familiar - the city became Spanish in 1762 under the Treaty of Fontainebleu, went back to being ruled by the French in 1800 under the Treaty of Idefonso, and then in 1803 was sold to the United States by Napoleon, along with the rest of what would become Louisiana in what would become known as the Louisiana Purchase. Wandering through its streets is like being transported back into a different era in time, and almost as if you are in a different country, with its colonial style houses and the French street names. 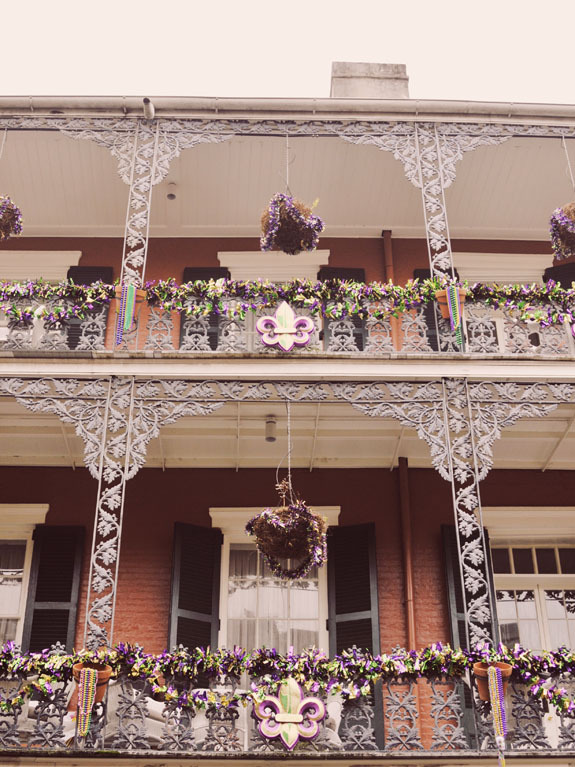 I think that the best way to take in the history and the charm of the French Quarter is just to wander aimlessly, but if you want more insight into the history behind the neighborhood, there are also organized tours that are offered as well. There is even a free walking tour. Today, the French Quarter is the most touristy part of the city, and it is home to many hotels, restaurants, bars, and shops. There are definitely many choices to get your eat, drink, and shop on here! Definitely stop at the French Market for some souvenir shopping and grab some snacks at the food stands. Originally known as Place D'Armes during the French colonial times, this is the main square of the French Quarter and home to the St. Louis Cathedral, which is one of the city's most iconic buildings. The church is also the oldest Catholic cathedral in North America, and you can check out the inside during non-mass times. Jackson Square is a great spot to sit, rest your feet, and people watch (all while enjoying some beignets and a cafe au lait from Cafe du Monde, which is across the street). You will find a handful of street performers at all times, and lots of street vendors line the perimeter, selling some beautiful artwork and local handicrafts. New Orleans is known as the birthplace of jazz, so that makes it the perfect city to go out and listen to live jazz. It is also known for its nightlife. It would be criminal not to experience these things on a trip to the Big Easy. Bourbon Street is known for the nightlife center of the city, but it has a bit of a raucous vibe (think Vegas of the South). 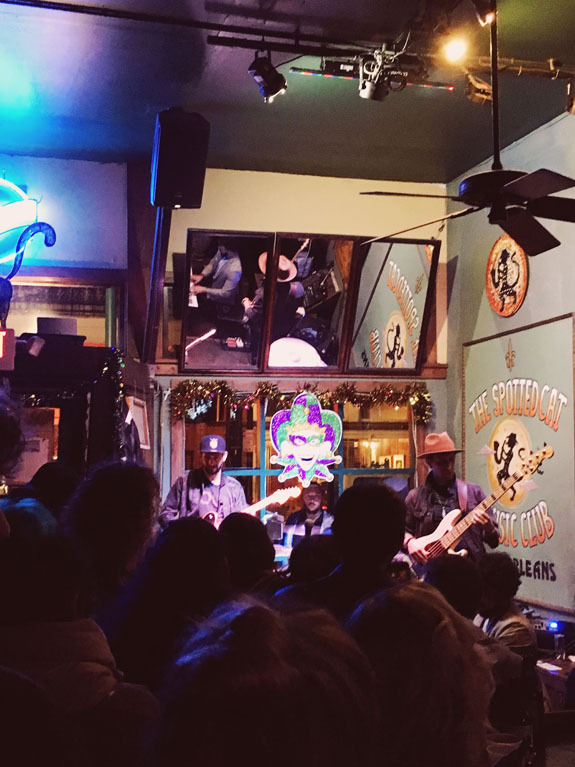 I would recommend that you head over to Frenchmen Street instead, which is where all the locals party, and is known for its jazz clubs that play live music every night of the week. There are even street performers playing jazz on almost every street corner here. We ended up at the Spotted Cat Music Club, which was recommended to us by several people. The jazz band that was playing that night was pretty amazing. Keep in mind that the Spotted Cat is cash only, so have some cash on hand (there is also an ATM inside). 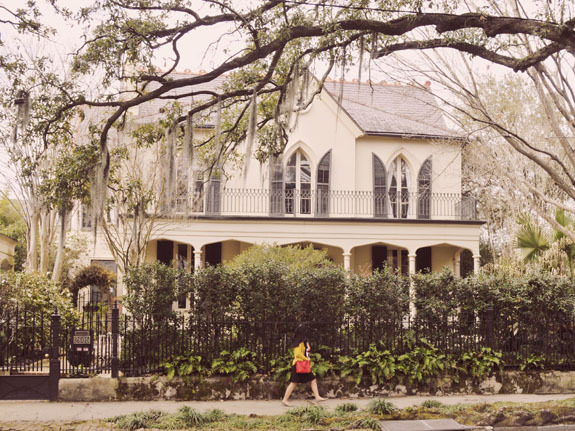 Explore the grand historic mansions of the Garden District, which is home to some of the city's wealthiest and most famous residents. While the French Quarter was settled by the Creoles during the French and Spanish Rule, thousands of Americans moved to the Garden District after the Louisiana Purchase. 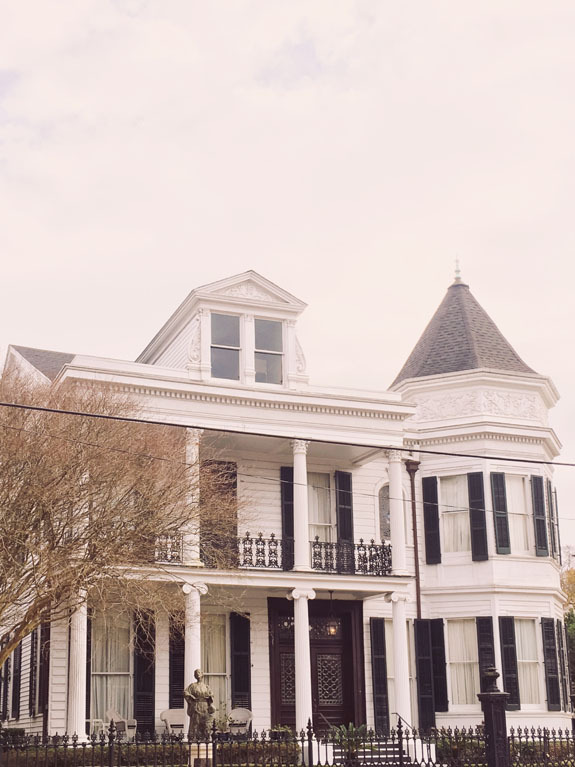 Some of the notable people who have once called the neighborhood home over the years include Sandra Bullock, John Goodman, Trent Reznor, Nicholas Cage, New Orleans Saints Quarterback Drew Brees, Anne Rice, and Archie Manning (father of NFL stars Peyton and Eli Manning). The Buckner Mansion, the Coven house in American Horror Story, as well as the inspiration for Disney's Haunted Mansion, are also in the neighborhood. 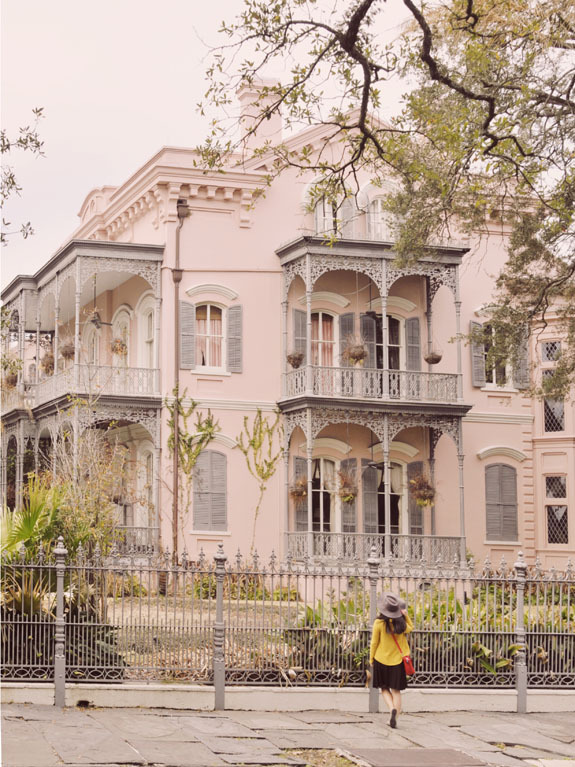 There are guided tours available, like this one, if you want more detailed insights into the history and construction of the most notable homes in the Garden District.Otherwise, you can just wander the streets aimlessly, or just take a self-guided tour. The one we used is this one - the great thing about this one is that you can do it in as little as 45 minutes, or do a more in-depth version that takes up to 2 hours. 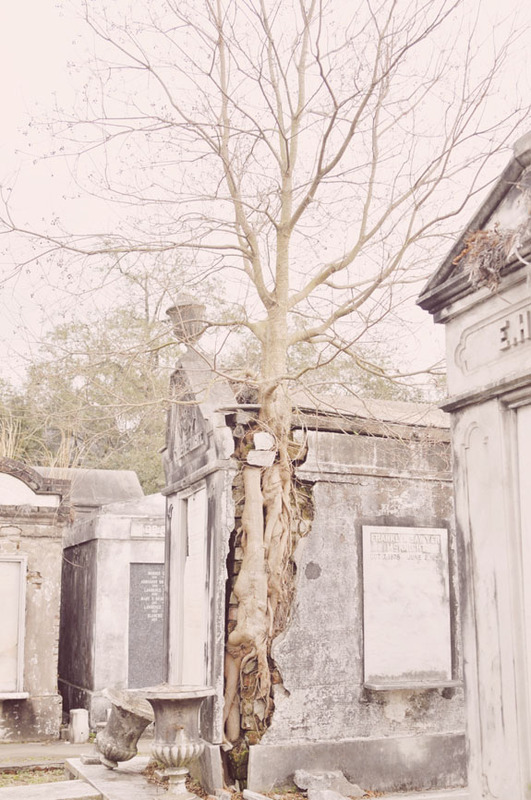 New Orleans is built on a swamp below sea level, which means that the dead are housed in grand mausoleums instead of buried in the ground. The cemeteries in the city are unique, and you will never see anything like it. There are a number of famous cemeteries throughout the city. 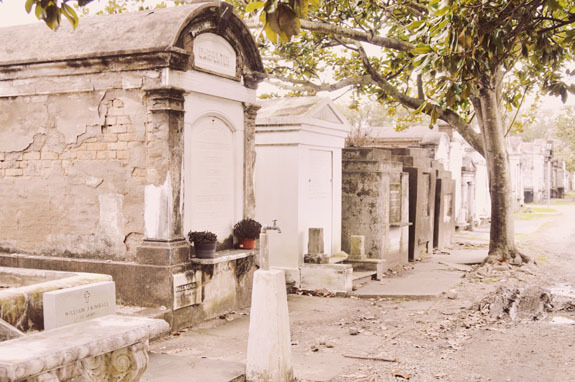 One of the most popular is St. Louis Cemetery No. 1, which is also the oldest in the city. Some of the most notable who are buried here are Marie Laveau, aka the voodoo queen, and Nicholas Cage - okay, so he's not dead yet, he already purchased a spot here to be buried in. Due to some recent vandalism, the only way to visit St. Lous Cemetery No. 1 is to book a guided tour, which you can read more about here. Another popular cemetery is the Lafayette Cemetery No. 1, which is located in the heart of the Garden District. This is the one that I visited. The Lafayette Cemetery No. 1 is known as "the movie cemetery," since many popular movies and TV shows have been filmed here. You can explore the cemetery grounds on your own, or you can take a free tour, which is what I did. They are readily available right outside the premises, and work on tips. The tour is 20 minutes, and gives you a great insight into some history, the burial process, and notable people who are buried there. Definitely worth it. You can read more about the tours here. Note: The cemeteries close at 3pm, and close at 1pm during the entire Mardi Gras season, so plan accordingly. This street stretches all the way from downtown to Uptown and passes through the Garden District along the way, making it a perfect place for a stroll after touring through the neighborhood. The street is lined with an abundance of restaurants, bars, cafes, galleries and boutiques, making it the ideal stop for a bite to eat, a beverage, and some shopping. The houses and storefronts are so cute and decorated to perfection, so it is a great street for some wandering and browsing. Just to say you did it, because #YOLO. 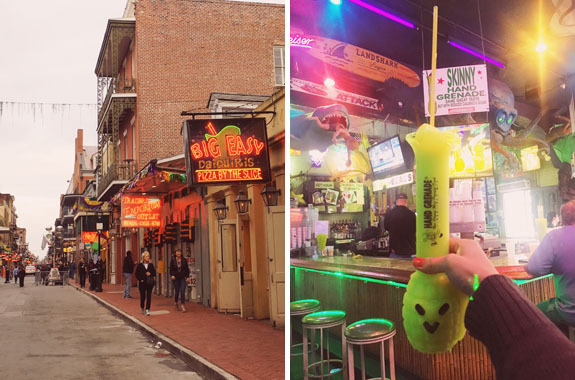 Honestly, I kind of hated Bourbon Street - it was pure madness and not in a good way, and such a tourist trap - but you have to see it and experience it once in your lifetime. The two drinks of choice here are a hurricane and a hand grenade. I hated the hurricane, but I ended up getting one at some random bar - apparently, the *only* place to get one is at Pat O'Brien's. I was told to go get a hand grenade at Tropical Isle so I did, and I kinda liked it - much more than I thought I was going to. These are some of the activities that were recommended to me, but that I did not get to do this time around - that just means I will have to make a return visit, right? Explore the green spaces - New Orleans is home to some beautiful parks and green spaces. Two of the most well-known are Audubon Park, which also has a notable zoo, and City Park, which is one of the oldest urban parks in the United States. Both are easily accessible from the downtown area via streetcar. Swamp tour - Louisiana is mostly flat (the highest point in the state is Driskill "Mountain" which climbs to a whopping 532 feet), so most of the state, especially the coastal areas of New Orleans, are home to an abundance of wetlands. You can tour the swamps of the wetlands via airboat, see the unique wildlife, and learn more about the ecosystems in the area. The tours usually take place about 40 minutes outside the city, and pickup and drop-off is available from many downtown and French Quarter hotels. For more information, see here. Plantation tour - Plantation life is very much a significant part of the history of the New Orleans area. One of the most well known is the Oak Alley Plantation, which is located about an hour outside of the city. The plantation features a gorgeous tunnel of oak trees leading up to the grand plantation house. Behind the beauty, of course, is a sad history, and I have read that the tour gives you a look into both the glamour and the horror of plantation life. You can read more about the tour here. Note: There are combination tours that take you to the swamp and the plantations. See here for more information. Steamboat cruise - This is something that I really, really wanted to do during my 3 days in New Orleans; unfortunately, the Steamboat Natchez was closed for maintenance during my trip. You can do either a harbor cruise or a jazz cruise, which also includes a dinner buffet featuring a menu of classic Southern cuisine. I mean...if you don't go Cafe du Monde, did you even go to New Orleans? Cafe du Monde always has a line out the door, and for good reason. One bite of the doughy goodness, covered in no less than 1 inch of powdered sugar, and it's easy to see what the hype is all about. I went here 4 times in my 3 days in New Orleans, and I am still having withdrawals. Tip: The main location on Decatur Street is open 24 hours - go early in the morning or late at night for the shortest wait. 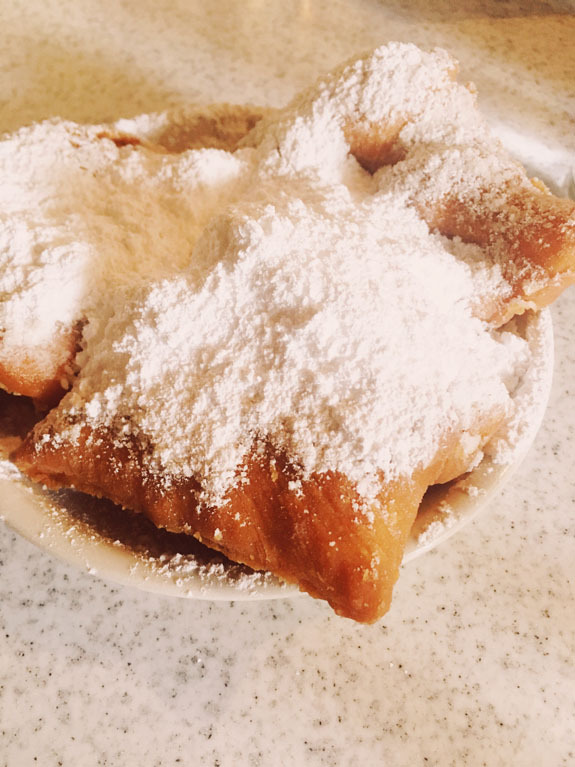 The take-out window also has a significantly shorter line, and you can take your beignets and coffee (their cafe au lait is also tasty) to enjoy in Jackson Square, which is across the street. There are also additional locations in the city. 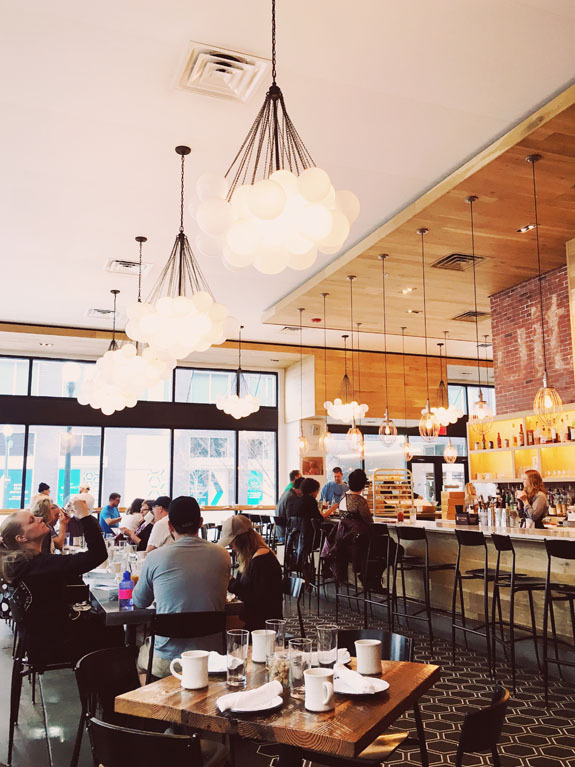 Willa Jean is a relatively new and popular spot by acclaimed New Orleans Chef Kelly Fields, and is a perfect spot for a tasty brunch. The decor is hip but elegant, and the food is amazing! Willa Jean serves up Southern comfort food with a modern twist, made using fresh, local ingredients. 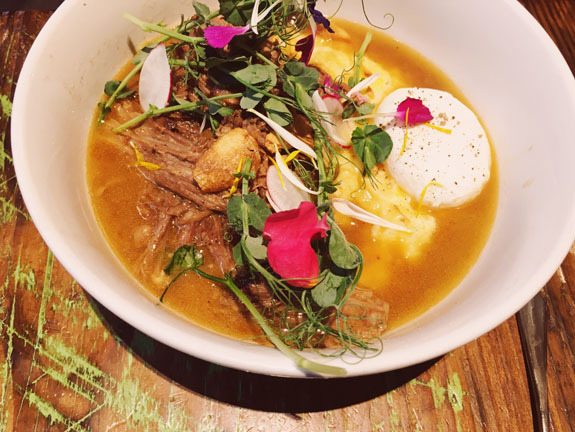 The biscuits are a must here, as is the hangover bowl - braised short ribs, caramelized onions, and a poached egg over grits. Fields is pastry chef, so you must check out the pastries as well. Apparently, the cookies here are to die for, but I totally missed out on them this time - oh well, that's just a reason to go back. Gumbo is such a staple of Cajun cuisine, so of course you're going to have to try some while you are in New Orleans. 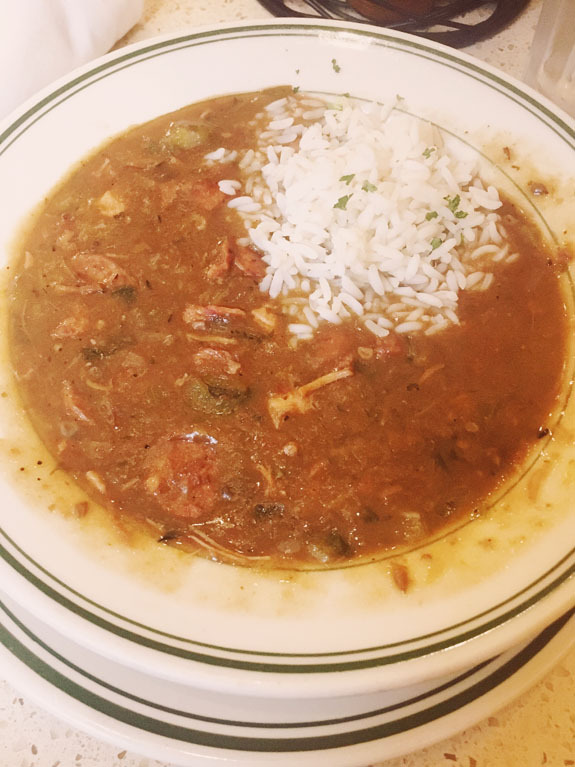 Conveniently located in the middle of the French Quarter, the Gumbo Shop evokes a bit of a traditional New Orleans feel, and serves up this hearty dish along with many other Cajun classics. It *is* called the Gumbo Shop, so the gumbo better be good, and it is solid. They also have a veggie option, so it is a good choice for the vegetarians out there. Drago's was a recommendation from my friend Andrea of Andrea's Travels, who had been convincing me to come out to New Orleans for well over a year by talking about how amazing the charbroiled oysters here were. She wasn't kidding. 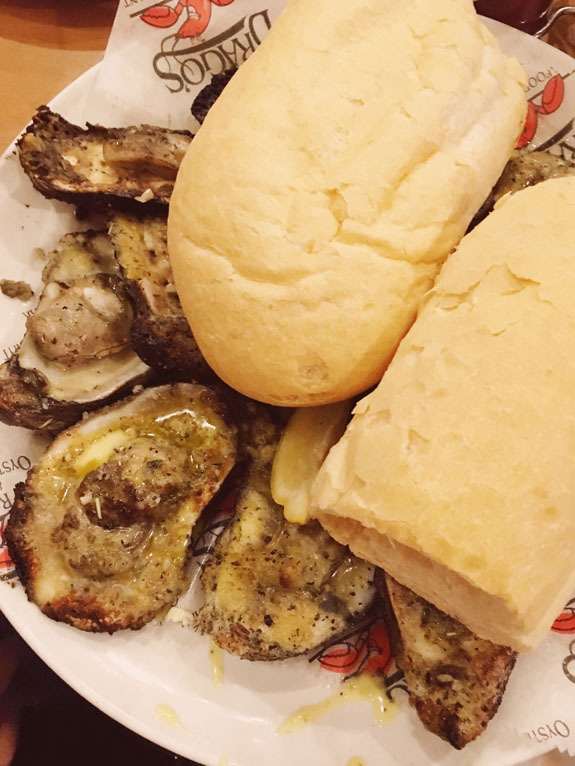 Drago's is nestled unassumingly inside the Hilton on the waterfront, and the charbroiled oysters, which come dripping with a garlic butter sauce, are definitely the star here. They also come with a generous helping of French bread, so you can soak up that sauce long after the oysters are gone. New Orleans may be full of kitschy old-school candy shops, but then there's Sucre - there is a location on Magazine Street, and one in the French Quarter as well. 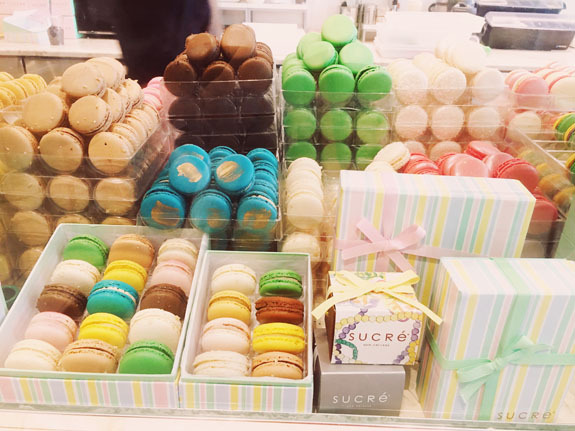 You can find a selection of pastries, cakes, artisanal chocolates, and gelato at Sucre, but I came for the macarons. You can find some unique macaron flavors, like Bananas Foster and jasmine tea, as well as seasonal specialties, such as King Cake for Mardi Gras - yum! 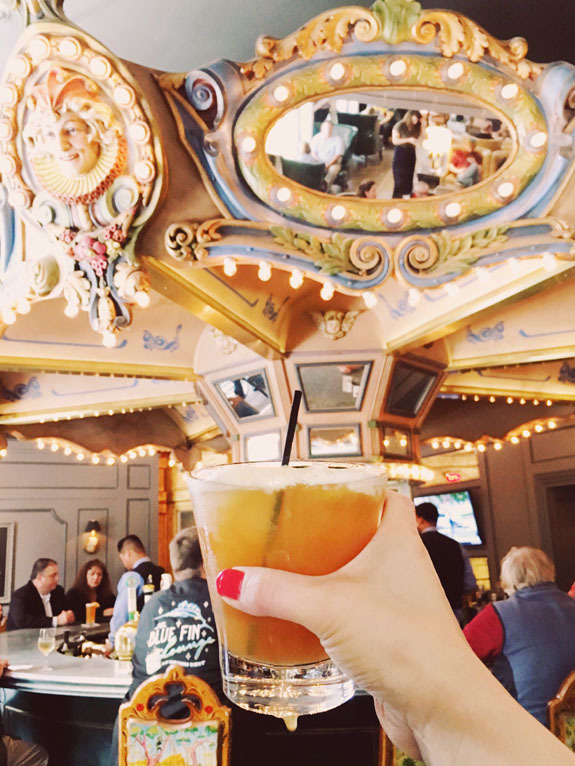 Grab a cocktail at this popular bar (a Pimm's Cup, perhaps? ), and try to sit at the bar for the most unique experience. Yes, it's a carousel, and yes, it moves. It is kind of a strange experience since it moves and you can see the bar go by, but it is definitely fun! It tends to get crowded all the spots at the carousel tend to fill up quickly - however, you can always grab a spot at one of the tables in the lounge, and wait until some spots on the bar free up, like we did. You'll find a line out the door at Mother's and it's for good reason. You will also be ordering a Ferdi's Special, which comes with ham, roast beef, and "debris" aka au jus. 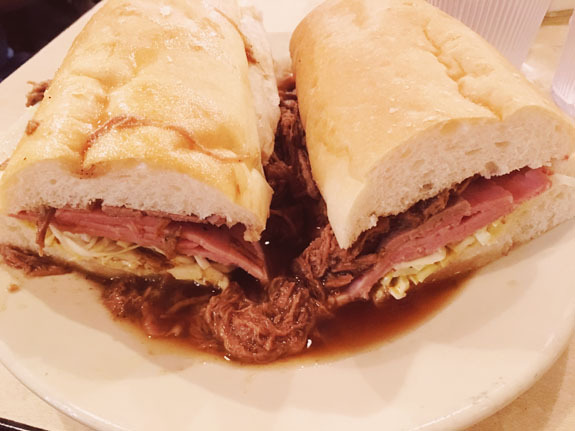 It is part French Dip and part Po' Boy, and all delicious. Keep in mind that the sandwiches are MASSIVE - one is more than enough for two people. 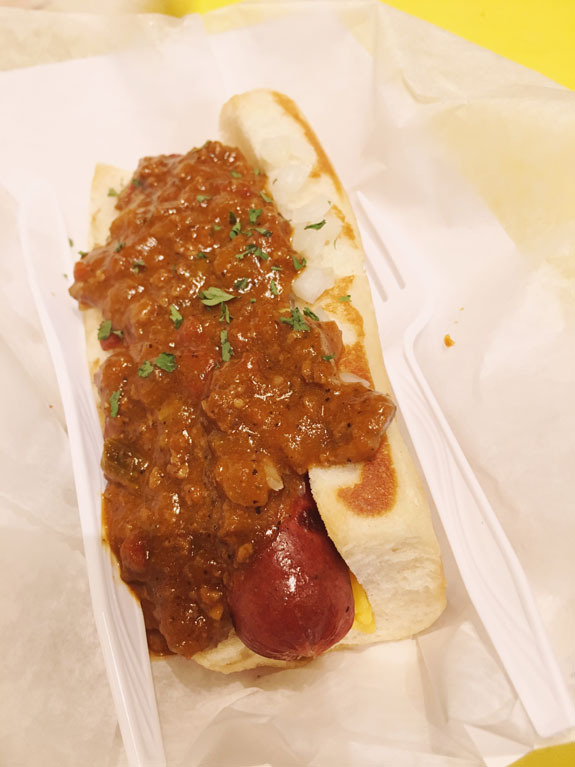 Dat Dog has locations throughout the city, but the one on Frenchmen Street is perfect for a late-night snack after enjoying some live jazz at one of the nearby bars. Your sausage options include classics such as Bratwurst and Kielbasa, to anything from alligator, crawfish, and duck. Choose your toppings from a extensive menu - they pile them on top. There's also a bar in here, and there's a happy hour from 5-7pm, and the vibe is fun. I strolled up to Willie Mae's to find a giant line out the door, but one bite of that fried chicken and it was easy to see why - it was the best fried chicken that I've ever had in my life. Apparently, the James Beard Foundation and the Food Network agree with me. It's juicy, tender, and its batter is spiced to perfection - really finger lickin' good. Be sure to also order a side of the butter beans, which comes smothered in a tasty gravy with a little bit of rice - the perfect accompaniment to that perfect chicken. 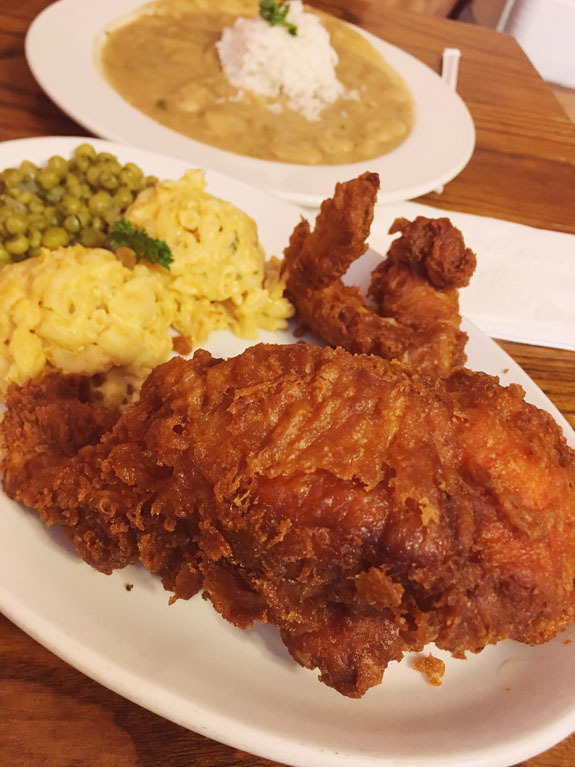 Willie Mae's is a bit far off the main tourist drag, and the surrounding neighborhood can feel a tiny bit sketchy, so you may want to take an Uber or Lyft there - but it's definitely worth the trek. Also, they are only open for lunch and closed on Sundays, so plan accordingly. 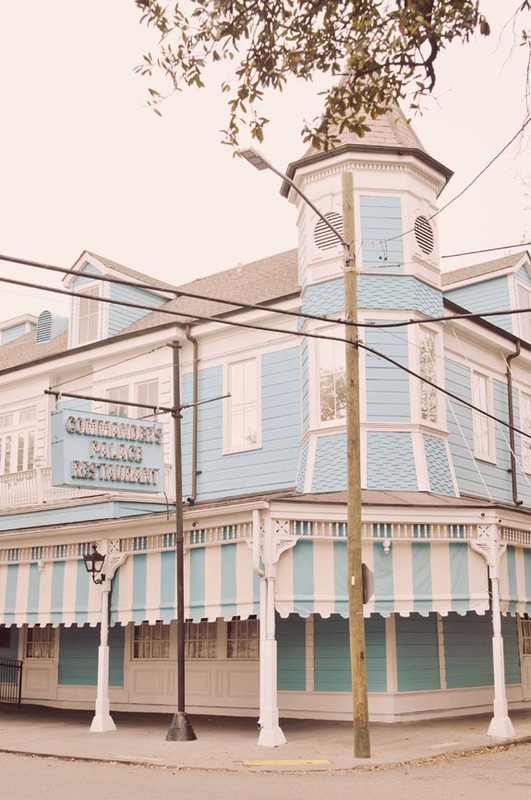 Full disclosure: I did not dine at Commander's Palace (but did indeed snap a photo in front of the iconic blue facade, because what kind of Instagrammer would I be otherwise?!). It is a New Orleans legend and comes highly recommended by many. Reservations are a must and there is a strictly enforced dress code, so plan ahead accordingly (clearly, we didn't). They are known for their 25 cent martini lunch, at which you can order up to 3 martinis for just a quarter apiece with the purchase of an entree. Dress to impress, enjoy, and be sure to tell me how it was. Saving the best for last...Shaya was originally recommended by my friend Laura, who said she still had dreams about it, and then I saw it featured on the Netflix show Somebody Feed Phil. Every single local who we talked to got super excited for us when we told them we were going to Shaya. Shaya definitely lived up to all the expectations - it is truly something special, and one of the best meals I've had in my life. 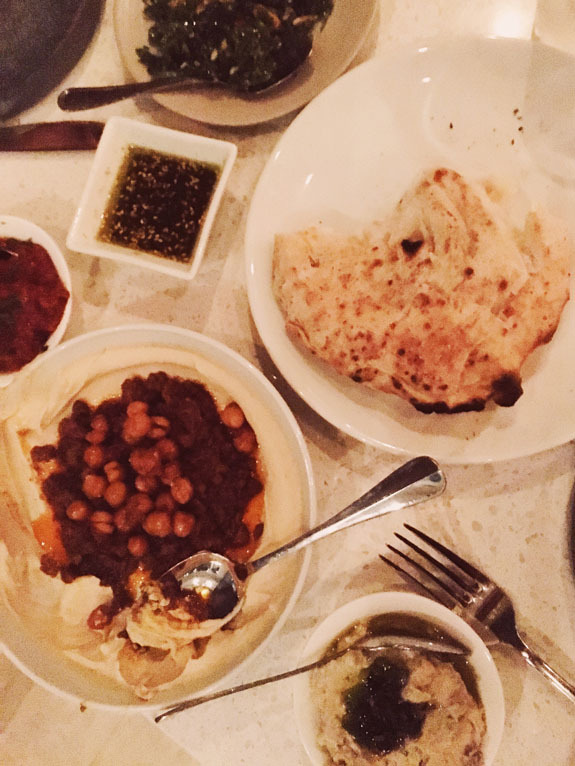 Shaya serves up traditional Israeli cuisine with a Southern flair - like a lamb ragu hummus, which was the best part of the meal. This is served up with a helping of pita bread, baked in the wood fire oven in the back, and unlike any pita bread you've had (and yes, we kept it coming all night). You will also definitely order the Salatim, which are little platters of dipping sauces and salads, such as the lutenisa, which is a puree of roasted pepper, tomato, eggplant and garlic goodness (that you can also dip your pita bread in). The wine list also perfectly complements the menu. Disclosure: I was hosted as a guest by Hotel Maison de Ville and received a complimentary stay at the property. As always, all opinions are my own. This post also contains affiliate links. This means that if you make a purchase or booking, I may receive a small commission at no additional cost to you. Have you been to New Orleans? What are some of your favorite things to do there? Love love this post! New Orleans is such a fun city, and those oysters and Beignets are 😍😍 So glad we were able to hang out! Gosh, I would love to go! I think I would basically just wander around the French Quarter and eat until I burst, haha! I've been to many states and cities in the USA but never New Orleans, so many of my friends have been and said it's incredible! After reading this, it's just making me want to book tickets here now, the architecture is just stunning! I spent three days in New Orleans several years ago, but it was during Mardi Gras so my itinerary was essentially "party and sleep". Would love to come back any other time of the year and do this city justice, one day! Loved all the pictures.specially for food pics. Detailed post and very helpful. What a fantastic article!! You've covered everything I wanted to know (I've fancied visiting New Orleans since I was a teenager - this has really bumped it higher up my list!). Beautiful photos, and I love the idea of a dog parade! And that food. O.M.G. Such a great post! I have been in that area but did not fully experience it at all (was also younger). Can't wait to go back and will for sure be saving this post for later. Beautiful photos as well :) Glad you saw the cheap flights and just went for it! I loved reading this! I was recently in New Orleans, and your photos brought back so many memories. 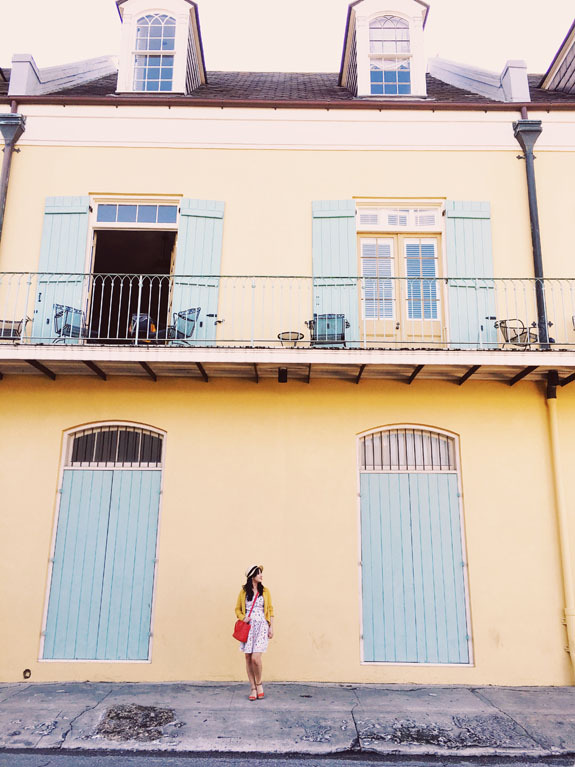 Your boutique hotel looked adorable - I didn't get to stay in the French Quarter, but am totally wishing I did after seeing your photos! Wow! What an amazing post packed full of information! I love all the photos, the buildings all look so pretty and the food pictures have made me really hungry! My little sister is here right now! I'm sending this to her. Thanks for sharing!! Such an indepth and helpful guide. Would love to wander through the french quarter and the garden district or explore the local cemetaries or listen to some jazz. I also wouldlove to eat my way through the city! So yum!! One of my favorite cities!! That hotel looks lovely and I so enjoyed the carousel bar! 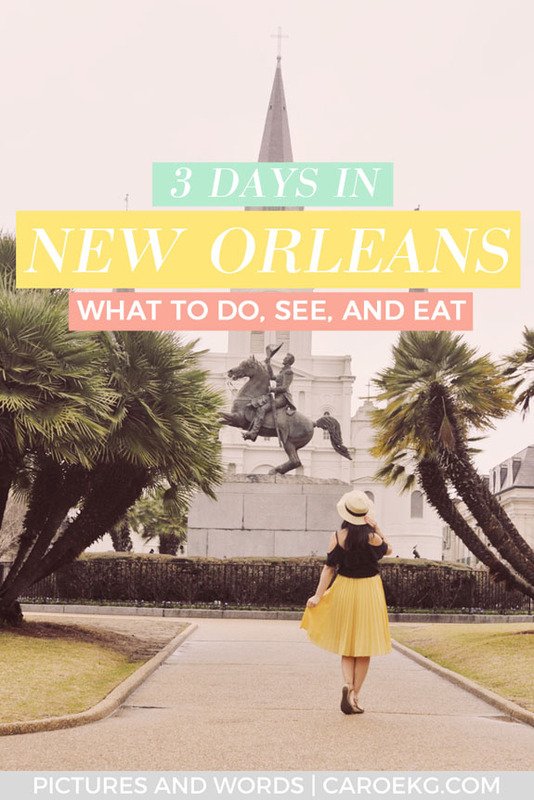 I used to frequent NOLA as it's only a 6 hour drive from Houston, so I must say, you've visited some great places to see and eat! Beautiful photos! 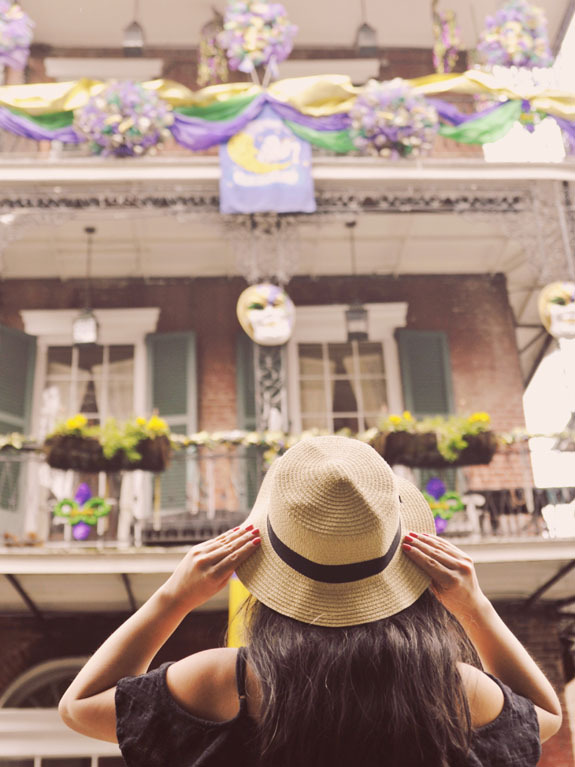 We haven't been to new Orleans yet, but it's on the list! I'll definitely be using your guide when we visit. Thanks for the tips! My husband was there about 9 years ago and said he had a great time. He loved all of the colors all over the city. It is a really great foodie city and it will force you at times to get out of your comfort zone and try some seafood. The history of the city is extremely interesting and he loves learning about it. I hope we can go there together sometime soon. I've always wanted to go, and this amazing guide only makes me want to go sooner! Absolutely beautiful photos and fantastic tips! Nice! I agree with you on your restaurant recommendations such as Drago's, Commander's Palace, Cafe Du Monde, etc. NOLA is such a great place to party and eat any time of the year. But I'd love to revisit during Marci Gras and Jazz Festival.